So I just found out that this month is also National Peach Month or Peach Appreciation Month. And there’s nothing wrong with enjoying some peaches in the summer (or any time of year for that matter). Now this recipe is the most thrown-together one that I’ve done recently. 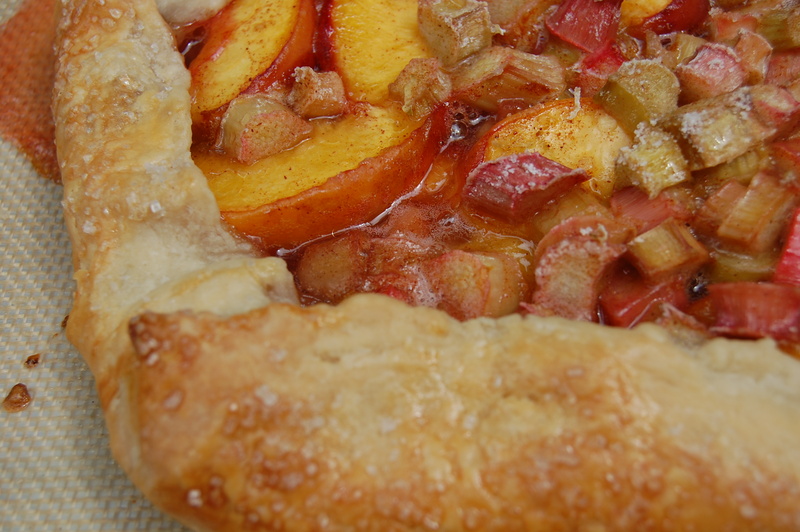 No real exact measurements, just some rhubarb, some peaches, sugar, cinnamon, and flour. But it’s a crostata so it’s supposed to be all rustic and wholesome and quaint. So this fits the bill. But I did add some crystallized ginger to this one to give it some added bite. 1. Preheat the oven to 375 degrees F. Roll your dough out into a round about 1/4 in. thick. 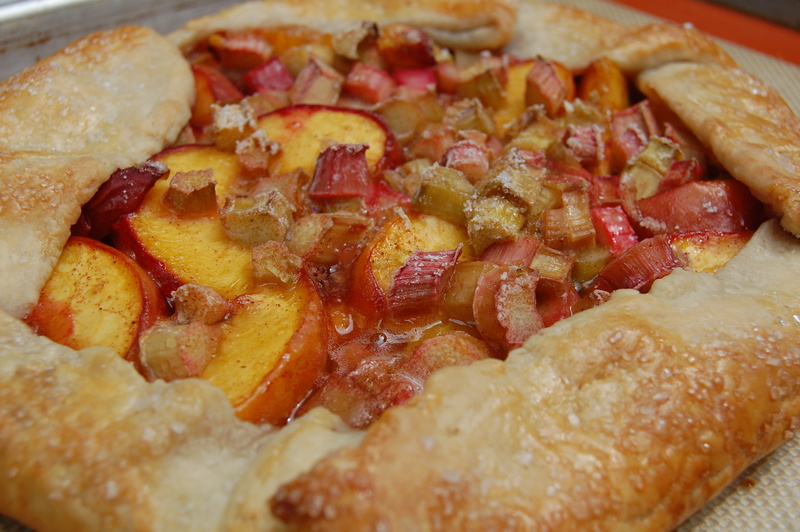 Pile the peaches and rhubarb in the middle, leaving a couple of inches around the edge for the crust. Spread the ginger across the top. 2. In a small bowl, combine the cinnamon, sugar, cornstarch, and salt. Sprinkle mixture over the top of the fruit. Fold over and pleat the edges of the crust, pressing to seal. Brush the crust with the egg wash and sprinkle with the sanding sugar. 3. Bake in the oven for about 30-45 minutes, until nicely browned and the fruit has softened. Let cool for about 5-10 minutes, and serve. This entry was posted in Culture, Pies and Tarts, Recipe and tagged Culture, Food, Pies and Tarts, Recipes. Oh wow, this looks amazing. Almost like a strudel or something. Yum! I’m loving all the fresh fruit blogs on wordpress at the moment. I keep stumbling across plum trees and stealing them 😀 – the fruit not the trees by the way. it would be kinda difficult to steal the tree! Wow! First time I ever heard of rhubarb and peaches together! This is so tasty! I luv how it turned out — so summery! It easy to make something good when the fruit was so delicious on its own! Interesting combo of peach and rhubarb! Sounds fantastic! i’m working on a whole wheat crust. i hope to post that experiment soon!